Before you start gluing your tile to the shower wall, carefully read the labels of your product and your tile, paying attention to mixing instructions and trowel specifications. Use a piece of cardboard or toothpick to scoop out any mortar that oozes through the grout joints. 1. 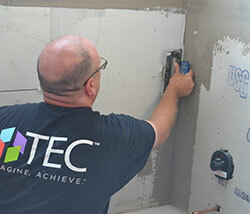 Use the flat edge of your trowel to apply shower mortar. Install your shower floor according to the quarters you drew in chalk while laying out your tile design. So, plan to begin at the center point of the surface and move outward – covering one quarter at a time. Begin in the farthest quarter from the exit and work toward it, to avoid walking all over freshly laid tile. When this is unavoidable, put a plywood sheet over freshly laid tile and kneel on it while installing. Make sure there is no adhesive between your plywood and the tile – otherwise, you’ll pull up tile when you move the board. With the flat edge of the trowel, apply thin-set mortar, beginning at the intersection of the guidelines and working outward. 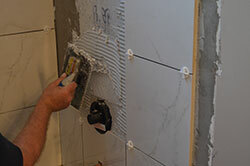 Then, using the notched section of the trowel, go back and “comb” the shower mortar to form straight, even ridges. Don’t be afraid to apply pressure to your trowel! Work in areas of about 3 square feet at a time. If your adhesive loses its tackiness to the touch before you lay tiles, you’ll need to stop setting, scrape the floor clean and re-apply mortar. If you carefully laid out your tile before mortaring, bonding the tile to the 3-square-foot sections you’ve mortared should be relatively simple. Press your first tile firmly into position at the intersection of the lines, with a slight twisting motion. Do not slide the tile into place. 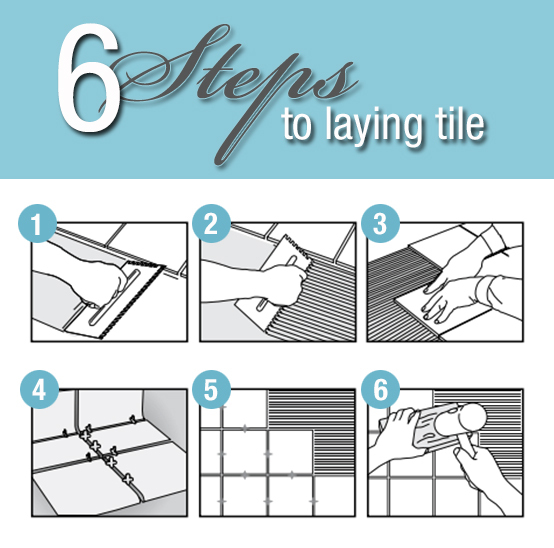 If your tiles are not self-spacing, place spacers between them to maintain even grout joints. You can buy tile spacers at Lowe's. Install tiles in a step-like pattern, working upward and outward. That is, the first row of tile placed in the mortared area should have the largest number of tiles, and each row after that should have one or two fewer tiles. Installing in this pattern allows for easier adjustment of tiles if there is an error. No matter how “in the zone” you get, periodically take a step back from your floor to make sure that your joint lines are straight and even. If you're happy with your floor's appearance, tap down tiles with a beating block and mallet to ensure that they are level. Make sure to use a beating block – otherwise, you might crack your tile. If adhesive oozes from the joints, wipe them with warm, soapy water. At least 2/3 of the tile thickness in the grout joints should be completely clean to allow for grout. Complete one quarter of the floor before going on to the next – remembering to leave room for movement joints between the tile and adjacent walls. Patiently follow instructions on the mortar regarding its wait time. If you’re setting tile in an especially cold or humid environment or over existing tile or laminate, allow more time for the tile to set before grouting. Similarly, larger porcelain and glass tiles also have extended set times. The guidelines you drew are crucial for wall installation. You will begin laying tile where your initial horizontal guideline intersects with the vertical line through the center of the wall. Attach a support strip to the bottom of your base horizontal line. This support strip – which can be a ¼ in. 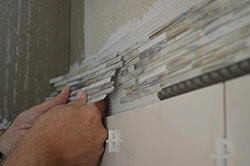 piece of lattice nailed into the wall – will support the tiles until the adhesive has a chance to set. It will also guide your installation, so make sure that it is exactly level. With the flat edge of the trowel, apply thin-set, beginning at the intersection of the guidelines and working outward. Then, using the notched section of the trowel, go back and “comb” the mortar, creating straight lines of even ridges. Follow the same process mentioned above for installation shower floor tile. Press your first tile firmly into position at the intersection of your horizontal baseline and the vertical centerline with a slight twisting motion. Do not slide the tile into place. 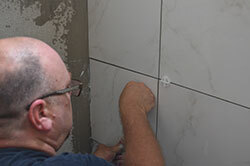 If your tiles are not self-spacing, place spacers between them to maintain even grout joints. Work in a pyramid shape from your crossed reference lines outward and upward – until partial tiles are required at the walls’ edges. When you have several rows complete, you can remove the support board. Do not forget to leave room for movement joints where walls intersect. Follow the same direction features above for installation floor tile. As you approach the end of your installation, measure the areas that will require partial tiles as described previously. After the shower mortar has been laid and the shower tiles installed, the next step on the path to a great shower tile installation is to grout the shower.